Agent for Clyde Line ships, Heiman Kaminski was co-owner of the Linah C. Kaminski, named for his mother. Born in Posen, then part of Prussia, Kaminski immigrated to South Carolina at age 15, clerked in a store in Conwayboro, and joined the Confederate army. At the war’s end, he moved to Georgetown with two silver dollars in his pocket. Within ten years he was one of the town’s wealthiest men. 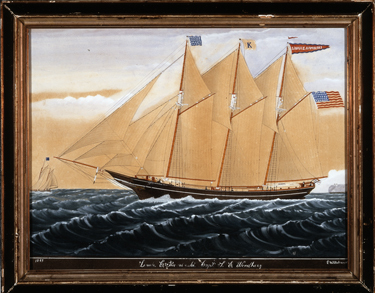 Built in Bath, Maine, the Linah carried lumber and naval stores from Georgetown to New York, and general cargoes on the return. She weathered a collision in 1887, but in 1915 collided with a Spanish steamer and sank.